Q: What can I expect from Acupuncture? A: Very thin (size of hair strand) filiform, stainless steel needles are inserted in specific points on the body to balance the body's energetics which may be imbalanced. Q: What can acupuncture and Chinese herbs treat? 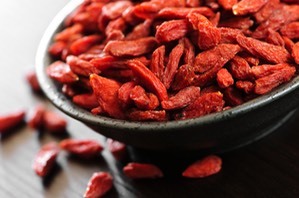 The Goji Berry or Chinese wolfberry fruit is a powerful antioxidant. It is used to treat sore back and legs, diabetes; blurred vision and diminished visual acuity. A: Chronic conditions typically take 6-10 acupuncture visits to experience results. Acute conditions typically take up to 6 or fewer treatments for improvement. Q: Does acupuncture feel uncomfortable or painful? A: No, it is extremely gentle but effective. Following the insertion of the needles, a profound calmness is felt in the patient. Typically, people fall asleep or at the very least meditate while they are lying on the massage table. A: Tui = Push; Na = Grasp are the literal transliterations of the word "Tuina" (tway-na). Tuina is a hands-on treatment that uses Chinese taoist and martial arts principles to bring the body back into balance. The eight principles which are being balanced include: Yin & Yang, Exterior & Interior, Hot & Cold, Excess & Deficiency. Emphasis is made on moving the Qi (vital energy within the twelve meridians and the organs). Tuina bodywork along with acupuncture can be used in treatment and management of joint injury and muscular pain. A: Qigong (chee-gong) "Qi" entails the meaning of "vital energy" or vital force, breathing, air, gas and vapor, but it can also be used in the context of describing the relationship between matter, energy and spirit. The word "Gong" is defined as that of achievement or results. The two words are combined to describe systems and methods of "energy cultivation" and the manipulation of intrinsic energy within living organisms. Q: Can children receive acupuncture treatment? A: Yes! In my experience, kids have tremendous vital force 'qi' and they respond very quickly to the healing art of acupuncture and Tuina massage! Q: Can I use my Health Insurance Plan for Acupuncture Treatments?